Genesis' "Tree of Life" is a Date Palm? Gertrude Bell in a letter to her father (12 June 1916) mentions the lush gardens near the Euphrates and in particular Date Palms "wreated" in grape vines, heavy with grapes. I note that the below Neo-Assyrian highly stylized Palm Tree is surrounded by an intricate and stylized series of interlocking vines. "We went first to Suq al Shuyukh, which lies on a southern channel of the Euphrates, and spent 24 hours there. There is a very charming political oficer, Mr Edwards, whom I had already met in Basrah - quite young but as clever as he can be - and a very interesting head man of the town with whom I had two long talks, learning much of town and desert. Suq, like every other place at this time of year, is hemmed in by waters, but the gardensS along the river are protected by low bunds and their fertility is incredible. Date, orange, nectarine, fig, and pomengranate shoulder each other; the vines, now heavily grape-laden, wreate from palm to palm, and the ground beneath is covered with melons, gourds, cucumbers and tomatoes. You must see to believe. It was so lovely - and also so amusing - that I left with immense regret, but I knew I ought to get back to my work at Basrah. We came very quickly into the Hammar Lake - the water has run down a good deal since I passed up and the world is beginning to reappear in places." "Though Herodotus did not know of vinevards, Zosimus, writing in the fifth century of our era, notices (as mentioned by Delitzsch) that in that country, even where no buildings are seen, palm-tree woods extend in every direction, the trees being encircled by vines whose hanging clusters covered their crowns." (p. 567. Charles H. H. Wright. "The Site of Paradise, an ancient problem solved by modern scholarship." in James Knowles, editor. The Nineteenth Century, A Monthly Review. Volume XII. July-December 1882. London. Kegan Paul, Trench and Company) Note: Wright cites extensively from Professor Franz Delitzsch's Wo Lag das Paradise? Leipzig, 1881, which attempted to identify Genesis' Garden of Eden with a location in Lower Mesopotamia. Please click here for a map showing Delitzch's proposal for location of the Garden of Eden.
" There are texts which refer to the sale of wine, and vines are shown on bas-reliefs in the British Museum dating from Ashurbanipal, entwined round the trunks of trees in a garden where the king is eating, and even in a game reserve where wild animals were preserved for hunting." 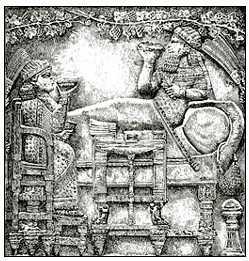 Below, Ashurbanipal and wife eating in his garden, grape-laden vines extending over his head from pine or cedar trees, _not_ date palm trees, which do appear next to the pine trees. 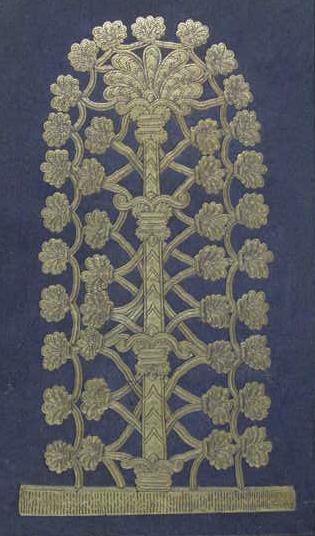 Below, the Sacred Tree (Assyrian), embossed in Gold Gilt on a book cover (William Harris Rule. Doctor of Divinity. Oriental Records. Monumental. Confirmatory of the Old Testament Scriptures. London. Samuel Bagster and Sons. 1877). Rule is a devout Christian attempting to "prove" the Bible is God's word via the findings of Archaeology. The "problem" in identifying the below lacework as being "grapevines" is that the leaf-structures resemble that of the larger highly stylized date palm they surround and encompass. It might be that the artist is intending to show a plantation of hundreds or thousands of date palm trees via this interconnecting lacework! Or, perhaps, that from a single "cosmic date palm" descend all other date palms? Such date palm plantations ("date palm gardens") existed in antiquity and they exist today in Iraq. "In the northern temperate areas of Iraq, trees are not difficult to plant. The relatively ample rainfall and the mild summer climate allow hardy trees to flourish with relatively little effort. But in the central and southern regions, the story is quite different. The arid climate and the scorching summer sun make tree survival unlikely without much care and attention. Irrigation is of the utmost importance. Anyone who has been involved in such an activity in Iraq, whether in husbandry or in simply planting a tree in a house garden knows how much effort and care that requires. Trees are consequently seen as precious. The most revered tree is the date palm – the Nakhla. Tall, majestic, beautiful, proud and tough… but it requires constant attention. A fully-grown tree can withstand decades of neglect. Yet, it requires a great deal of care to truly flourish and bear fruit. So much like Iraq. Every year, an expert has to go up each tree at least 4 times. The lowest row of drying leaves have to be removed, with the base cut in such a way to provide a foot hold for the climber. In April it has to be pollinated. In August, the dangling fruit bunches have to positioned so as to be supported by leaf stems or the main trunk. In September or October, the dates are harvested. There are more than 300 varieties of dates. Few people know them by sight. Most people are only familiar with the most common 3 or 4 varieties. The dry types store well for long periods without any special requirements. In the old days they, together with milk products, served the Bedouins for many centuries as staple diet. The less dry types are pressed, sometimes mixed with sesame, in 25 pound metal cans to exclude the air then sealed, to be consumed during the winter months. Most byproducts are used for something in addition to the dates: chairs, shopping baskets, large containers, etc. Even the large leaf ends were used to be covered with cloth and used as floating aids in teaching youngsters to swim. A whole culture is based on that tree. The date palm tree is so old in Iraq that many of the names of its parts and the tools used for the maintenance are Babylonian in origin, or even older… but still in use today. In the central region of Iraq, the date palms are used in orchards to provide cover for the more delicate citrus fruit trees such as oranges and lemons. They provide shade from the sun in summer and shelter from the cold winds in winter. The tree is so important that to harm it is almost unforgivable. During the early Islamic military campaigns, a well-known guideline by a leader to his troops going off to far away lands were: “Do not kill a woman, a child or an old man. Do not cut a tree”. I remember one particular incident about 15 years ago when two neighboring farmers contested the ownership of a small plot of land. One based his claim on a few date palm trees that he had planted. The other acted foolishly and, in anger, poured some kerosene into the growing tip – the simplest and quickest way to kill those trees. As a result, he lost all local sympathy. There was a time when there were more than 30 million date palms in Iraq, mostly concentrated in the southern Basra region. I don’t know how many there are now, but I expect less than half. Wars, increasing water salinity and neglect reduced the number considerably. One of the ugly sights of the war zones during the long Iraq-Iran war in the 1980’s was vast date palm orchards with all trees ‘beheaded’ and crown-less. To me they looked like bewildered large exclamation marks pointing towards the heavens. Near the ruins of ancient Babylon, just north of present Hilla, one irrigation canal stretches for about 30 miles from the Euphrates. On one side of the canal, along a road leading to a holy shrine, the whole area looks like one huge date palm orchard. In fact, they are many small plots around 5 acres each. In most of these, a grid of steel wire is constructed using the date palms as pillars. The matrix is used to support grapevines. The vines grow in the shade of the palm trees. A most beautiful sight! During the 1991 uprising, that area was the center of much ‘insurgent’ activity. The province governor at the time decided to remove all those orchards. No contractor would do it, except one greedy character. Although the owners were duly compensated, that contractor, who moved on to become rich and influential, is still followed by that stigma. He is still is usually referred to as ‘the man who killed all those trees’. Nowadays, most people who go along the road leading to Baghdad Airport feel a deep sense of anger at all those thousands of trees bulldozed by the US army for some security reasons." The Mesopotamians understood that the food which would bestow immortality on mankind was _not_ from a sacred tree, be that a palm tree or some other tree, it was _bread_! In the Adapa and the South Wind Myth (found in cuneiform on a clay tablet at Tell el Amarna in Egypt, the residence of Pharaoh Akhenaten, 14th century BC) Adapa's failure to eat the "bread of life" proffered him by Gishzida and Dumuzi on Anu's behalf, in heaven, is why man does not possess immortality. The food which sustained the gods was grown in their city gardens in the edin at Sumer by man, so the bread of life presented Adapa in heaven was actually the very bread he baked and presented to Ea and Anu at Eridu's temple in Sumer! Adapa had been warned by his god Ea in Eridu not to eat the "bread of death" Anu would offer him or he would die (recast apparently as Yahweh warning ADam and Eve not to eat of the Tree of Knowledge of good and evil in Eden). Thus Adapa refused to eat the "bread of life" offered him. Anu thereupon orders Adapa's removal and return to Eridu and mankind will never again have a second chance at eating the "bread of life" and obtaining immortality (Anu's guards, Gishzida and Dumuzi will bar any second attempt by Adapa to secure immortality like the cherubim, and I regard Gishzida and Dumuzi as pre-biblical prototypes of the cherubim). The "bread of life" mentioned by Ea apparently was recast by the Hebrew's into a "fruit of death" from the tree of Knowledge of Good and Evil, while the "bread of life" became the "fruit of life" from Eden's Tree of Life. Eridu is 12 miles SW of Ur of the Chaldees where dwelt Abraham, who probably recast these motifs into what would be preserved later in the book of Genesis (written circa 562-560 BC in the Babylonian Exile). Mesopotamian texts reveal that the best man could hope for was a "long-life like a tree" (Date Palms can live for 300 years if propperly cared for) and the Bible also seeks blessings for the righteous of a "long-life like a tree" too. Perhaps the Hebrews recast the "long-life" of a tree into an "eternity of life" from a tree's fruit? That the Date Palm was probably Genesis' Tree of Life is suggested by several biblical verses. Genesis has cherubim guarding access to the Tree of Life, denying it to man (Ge 3:24) and Ezekiel describes Solomon's Temple as decorated with cherubim and Date Palms (Ez 41:18, 20, 25). As cherubim protect a "tree of life" in Genesis it is assumed the palm trees they accompany in Solomon's temple are Date Palms. The presence of Assyrian kings near the Assyrian Sacred Tree (Date Palm?) may be an allusion as to why the gods appointed kings in the first place to rule over people. The gods made man to care for their Sumerian gardens in the edin, to harvest the garden produce and feed it to the gods in their temples. The gods created kings to supervise mankind, making sure the gods' gardens were properly maintained and cared for on the gods' behalf. Thus pictures of Assyrian kings standing near Sacred Date Palm Trees are acknowledging in iconic form that the kings are scrupulously carrying out the gods' wishes in supervising man's care of the gods' gardens in the Sumeian edin and bear rule over their subjects with the gods' endorsement (to rebel against the gods' supervisor or king is to rebel against the gods and incur their wrath). In other words the Assyrian kings are feathering their own nest by showing themselves caring for the gods' fruit trees (Date Palms) in the edin's gardens, and reminding their subjects they rule by the gods' will and not to be rebellious to their king. That is to say the Assyrian kings are _not_ worshipping the "sacred" palm tree, they may, however, be acknowledging it to be a "gift of the gods," an important food source for not only the gods but for mankind as well and they are thankful for it. One scholar, however, has noted that some gods were associated with trees, that is to say certain trees may have been manifestations of the gods. If this be so, then a tree could take on a "sacred" character as a manifestation of a god or goddess. Dumuzi was associated with the Date Palm according to the late Professor Thorkild Jacobsen of Yale University. If Jacobsen is correct then the Assyrian kings "might" be worshipping the Date Palm as an aspect of a deified Dumuzi (biblical Tammuz)? "We can distinguish the form of Dumuzi called Dumuzi-Amaushumgalanna, who appears to be the power in the date palm to produce new fruit. The name Amaushumgalanna means "the one great source of the date cluster"...and refers to the so-called heart of the palm, the enormous bud which the tree sets each year. This is the lightest and happiest of all the forms of the god. The cult celebrates his sacred marriage only...because the date is easily storable and endures." " The fact that, though stylized, the tree is undoubtedly a palm tree, and that the object which the genie is holding resembles in shape the pollen-brearing element of the male palm tree, has led some scholars to view these bas-reliefs referred to the act of fertilization from which the country's wealth in food was derived. There are however, reasons why this view cannot be accepted. Thus the genii are merely pointing the conical objects which they are carrying, in the general direction of the tree, while fertilization depended upon the male flowers being tied down on the female, and not on one light contact. Elsewhere the bas-reliefs show the genii standing behind the Assyrian king and pointing towards him the object which they are holding. On the other hand, remembering that in certain churches in the Mardin region, in the north of the ancient Assyria, the priest uses a holy water sprinkler in the shape of a cedar cone for his sprinklings of lustral water, we may fairly conclude that the two actions have the same significance, and that the bas-reliefs represent ceremonial sprinklings (which were a feature of Assyrian religion) of the life-giving water drawn, it was said, from the mouths of the Tigris and Euphrates; while the container with handles which the genii are carrying is not a basket but a wrought metal bucket, holding the purifying water." Below, an Assyrian genii with pine-cone (?) and bucket sprinkling a stylized Palm tree with vine tendrils. My own research suggests that the Garden of Eden is a myth based on a reworking of earlier Mesopotamian myths and combines motifs associated with several different locations. The principal location however is ancient Eridu in the land of Sumer. Here, a man called Adapa is allowed to obtain godly forbidden knowledge but denied immortality. His god, Ea, warns him in Eridu, "not to eat or he will die," the food to be offered him in heaven by the god Anu. For me, Eridu has become the Garden of Eden where a similar warning was given to Adam; Adapa has become Adam, Ea becomes Yahweh-Elohim who gave Adam the warning "do not eat or you will die," and Anu who offered Adapa the "forbidden food of death" becomes Eden's Serpent. Please click here for the story and satellite photos of Eridu and vicinity. 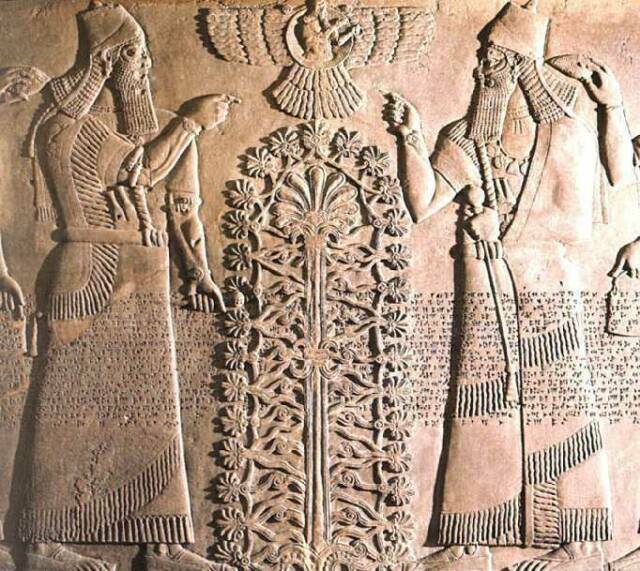 Below, a photo of a "Sacred Assyrian Tree" flanked by two images of a Neo-Assyrian king. 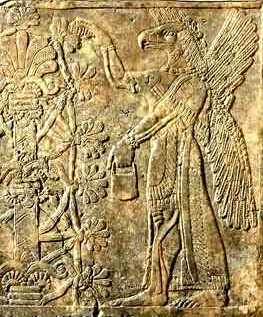 Above the tree is the god Assur assimilated to the sun disk with wings and tail feathers. "A text dating from the reign of King Shu-Sin, of the third dynasty of Ur...refers to the well watered palm plantation...Every part of the palm tree was put to some use. The wood was employed for light building construction, such as roofing where only a small span was required, the plaited fibres formed ropes of remarkable strength, while the leaves were used both for covering the huts made of palm boughs, and, when cut and bound together, make very effective brooms...Nor was the date itself a mere sweet-meat, as it is in Western Europe, but a food, and indeed the staple article of diet in those districts where the palm tree grew most abundantly. The dates, which were dried before preservation, were packed tightly into jars inside which they coagulated and began to ferment, which enhanced their nutritive value. Alternatively, they could be mixed with oil, which meant that they could be preserved still longer, while their food value was yet further increased. There are so many different varieties of date palms that markets in the East offer a wide choice of dates. Their stones, when dried, are used as fuel, especially for metal smelting, or, when ground up, are part of the feed of camels...Finally the 'palm sprout', the growrth at the top of the palm tree, if picked and eaten when still young, is a popular vegetable. It is indeed not surprising that the literature of the ancient world is full of complimentary references to the palm tree. Strabo refers to a Persian song which extolled the three hundred and sixty uses to which it could be put, and Kasvini quotes the following extract from the Koran 'Honour the palm tree, for it is your father's sister: and it has been given the name of the blessed tree because it was created from the remainder of the clay of which Adam was made'." Some scolars think Genesis' Tree of Knowledge of Good and Evil in the Garden of Eden is the fig tree because Adam and Eve make aprons to cover their nakedness upon eating of the forbidden fruit (Ge 3:7). "The fruit trees include date palms...pomegranates...medlar...apricot trees, plum trees, peaches...and finally fig trees. There are many varieties of fig, which ripen successively from June until the autumn...All these fruits grow mainly in the area of central Babylonia and of Assyria...represented on the Assyrian bas-reliefs, e.g., the fig tree on that from Khorsabad."